Last week we had an opportunity to test our PAKABO at an Elementary School in Štore, Slovenia. Participants were 14 children (9 boys and 5 girls) from a kindergarten group aged 4-5 years as well as two teachers. 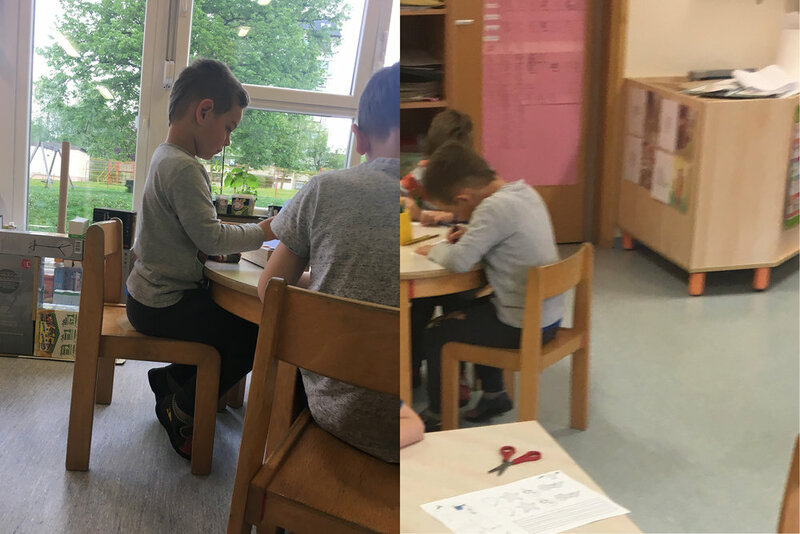 In Slovenia, children go to school when they are 5 years old, somehow a year later in comparison to England and Wales, or even two years later if we also take into the account the Reception year in England and Wales. Most of the children in the test had good graphomotor skills, good pencil grip, while some had a slight tendency to rotate paper when drawing lines. Children had some limited knowledge of hand writing and maths, because the Slovenian curriculum for this age includes only graphomotor skills and not letter formation. Only one child was left handed. Children sat behind 4 tables. One table had 3 PAKABO sets with 3 iPads, while on other 3 tables children worked on tracing sheets with pencils, crayon, scissors and glue. During the session children played following 3 digital games: PAKABO Bungee bugs, Robbie the Rocket and PAKABO memory. During the session children worked on following trace activities: numbers, bracelets, finger puppets, tracing objects, tracing scene 1 and tracing scene 2. The session started at 10:00 and finished at 11:45, just in time for the children to go out before the lunch. At the start of the session teachers briefly introduced two researchers and explained what children are going to be doing today. The work went very smoothly, with the minimal intervention from the teachers and researchers. Children would turn rounds between playing apps on the PAKABO controller and trace sheet activities. There was no problem with the transition between digital games and trace sheet activities. All children would accept that they need to take turns. Children played in turns on the PAKABO controller and iPad, each child played for about 10 minutes. PAKABO sets and iPad worked without any technical issues for the whole time of the session. Children were very independent with the iPads and PAKABOs, switching between 3 apps and between levels in the apps. All of children had some previous ICT knowledge and they were confident to control the volume of the sound, changing apps and levels. Children often shared their iPad screens with other children, discussing which game is better. Towards the end of the testing session, when most of children finished their work, some of the boys came to the table with PAKABOs and commented about the gaming style. Towards the end of the testing session, when most of children finished their work, some of the boys came to the table with PAKABOs and commented about the gaming style. Each child completed at least 3 tracing sheets. Children completed work sheet with numbers quickly. Most of the children had good pencil grip. One child formed the number by starting it at the bottom. Working sheets with bands proved most popular. Some girls managed to complete four of them, while the boys liked mainly the truck and balloon. Children were good with handling the scissors and glue. Teachers’ feedback was very positive. They liked the connection between characters in the digital games and trace sheets. They found very positive the way how screen time is managed by offering pen and paper activities. They also liked the look and feel of the PAKABO controller. The kindergarten in this school tends to buy wooden toys and learning material. Most of the children had a better posture when playing PAKABO set with an iPad, than when using a pen and paper based activities. While the feet were not fully flat on the floor at both instances, when playing PAKABO set, we noticed that the neck and shoulders were more relaxed and the back was straighter than when using pen and paper. We are happy how the test went. However there are still some user issues and we also find some ideas how to improve the experience. The lesson went smoothly, with the minimal intervention from the teachers and researchers. Children at this stage like playing digital games and were very quick to learn basic ICT skills, if they have not acquired them before at home. The test showed that the lesson can be controlled by a single teacher. Trace sheets provide enough material for 90 minutes work and at the same time are also interesting enough to offer children a good off screen alternative. Teachers’ feedback was very positive. They liked the connection between the characters in the digital games and trace sheets. They found very positive the way how screen time is managed by offering pen and paper activities. We would like to thank to the headmaster, children, parents and teachers of OŠ Štore for the visit. Links to the trace sheets (7MB). Older PostCursive or Print? Children still learn cursive but most parents do not use it.